Peck has given our family so much, and it really has been one of the biggest parts of our lives the past ten years. Peck has shaped who our boys have become – into the articulate, empathetic, scholastically-disciplined young men they are today. For Julie and Thomas Bliemel, a firm foundation and a global perspective go hand in hand. Over the past 11 years, The Peck School “family” has anchored them with a strong and supportive community, while at the same time, their ties to relatives outside the region and across the world have shaped them in profound ways. So how did the Bliemel family plant roots in Northern New Jersey while nurturing branches across the Atlantic? It began when a young woman from St. Louis met a young man from Germany while they were both working for Citibank in New York. Thomas originally travelled to the US as a member of a university exchange program. He flourished in this new environment, decided to stay on and complete his MBA, and then made his way to Citbank. Julie, who graduated from The University of Texas with a degree in finance, transferred to New York from the Dallas office of Citibank. They were married in 1998. After relocating to Chatham, NJ, and as their eldest son, Alec, approached kindergarten age, they made the decision to search for a private school with smaller class sizes and more individualized attention. “A neighbor recommended Peck,” explains Julie, “and we came on a tour. We immediately loved the school and knew we had found the perfect fit.” Several years later, they also enrolled their younger son, Marc. So when it came time for this campaign, Thomas and I decided that we wanted to pay it forward. Peck has given our family so much, and it really has been one of the biggest parts of our lives the past ten years. That strong sense of family and community resonated with Julie and Thomas, who were both raised by parents with a commitment to charitable giving, church, and community. “Because it was a big part of our childhood, we wanted to impress on our boys that it is important to give back,” says Julie. To the Bliemels, this sense of social responsibility extended not only to the community here in New Jersey, but around the world. At least once a year, Julie and Thomas take their sons to Germany to maintain ties with their European clan. While Thomas travels frequently with work, he has used his business trips to connect the family to the world through photos and other creative means. In their efforts to broaden their sons’ minds, give them a global perspective, and raise them with a world-view, the Bliemels have also used family vacations to learn about cultures and values. They have participated in an African Safari, ventured to the Galapagos Islands, and scaled the heights of Machu Picchu. 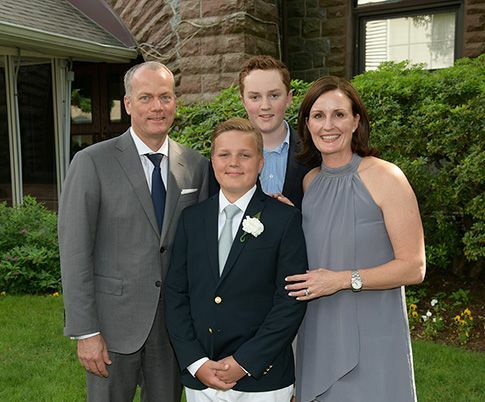 Despite the fact that their youngest son Marc recently graduated with the Class of 2018, and they have no other children at Peck to benefit from the current campus construction, Julie and Thomas have chosen to support The Peck Promise Campaign to pass on the many benefits they received from this community. When they arrived at Peck in 2006, the school had recently finished construction of a state-of-the-art athletic center and the Eckert Huff academic building.